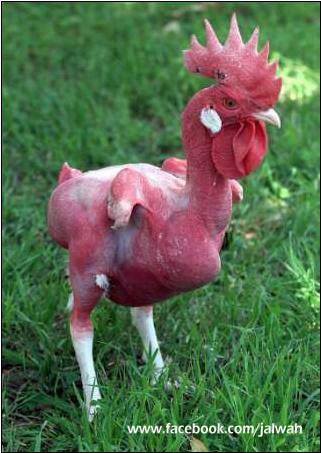 Featherless chickens were developed by altering them genetically through breeding practices. The idea was to prevent genetically altered broiler hens from becoming overheated due to their fast heart rate (which is much faster than regular chickens) because broiler hens were genetically altered to be hungry all the time so they would gain weight fast for commercial poultry meat production. Genetically altering the birds so that they could not produce feathers was considered a more humane solution than repeated plucking the feathers from the birds. The featherless chicken is considered a rare, exotic breed. They are a bare skinned prototype, a genetic mutation created by an Israeli geneticist. Avigdor Cahaner of the Hebrew University of Jerusalem who produced the featherless peeps by cross-breeding a naturally bare necked chicken with a regular broiler chicken. Commercial broiler hens were genetically bred to cause them to eat more and gain weight fast which causes their body metabolism to operate at higher temperatures than ordinary chickens. Their heart rate can go as fast as 300 beats a minute. This causes them to overheat especially in warmer climates. The cost of cooling the chicken houses to keep the birds comfortable and reduce deaths Cahaner developed a breed that grows no feathers and have no scales on their legs and feet. After six generations of breeding he was able to create the featherless bantam chicken and then he cross bred until he got a large sized version. He points out that sexually mature males turn red.(2). Lower in calories (for those of you who eat chickens). Critics of genetic mutations of birds and animal's have a different story to tell. "Naked" chickens of both sexes are more susceptible to parasites, mosquito attacks and sunburn. "Featherless birds would also be very susceptible to any temperature variations - especially as young birds," says Tom Acamovic, of the Scottish Agricultural College in Ayr (Young, Emma, 2002). ​Watch our featured video and see more photos of featherless chickens below. This video tells how featherless chickens were developed. They were actually bred to be featherless so that the chickens would not get overheated in hot and arid areas where many commercial chickens are raised. Exotic chicken books, chicken printed sloggers, slogger boots, chicken socks chicken pens, coops, and more!! Check out our best buys. Featherless chicken photos. Featherless chickens may stay cooler in the summer but must be kept out of direct sunlight and in the winter have no way to keep themselves warm so heat must be provided for them.